AWT Controls are nothing but AWT Components that allows the user to communicate with the user in different ways. Normally, positioning of LayoutManager inside a container will be done automatically.With this example, it can be concluded that window visual nature depends on the LayoutManagers and Controls. The UI elements are the one which user directly looks and interacts with. 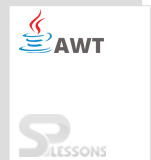 AWT has wide variety of common elements from basic to complex. Layout is defined as the order of placement of the components in a container. This arrangement can be done by LayoutManager. The detailed description about Layouts is given in AWT Layout chapter. These events figure out the behavior of UI elements when the user communicates with the elements. The detailed description about Layouts is given in AWT Layout chapter. Initially an instance of required control has to be created and in the next step instance should be added to the window by calling add() method. => The control can be removed from window by calling the method remove(). => All the controls can be removed at a time by calling the method removeAll(). Controls are components that communicate with the users. UI Elements, Layouts and Behavior of elements are the main requirements in AWT Controls.